Make your Christmas tree even more magical with a DIY Unicorn Paper Ornament!! 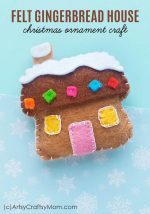 With craft paper, beads and glitter, this craft is a breeze to make! One of the Christmas activities that most families across the world enjoy this time of the year is the Christmas tree setup. From selecting a tree, to buying pretty baubles to setting it all up, it’s become a ritual that brings the entire family together! Well, it certainly brings the family and the neighbors over when we decorate the tree in our home! We reuse the same tree every year, and make most of the decorations ourselves, so this is an activity that fills our hearts and doesn’t empty our pockets! 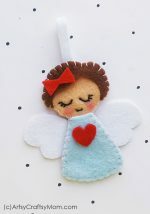 We make all kinds of ornaments like a cupcake liner tree, a quilled wreath, Popsicle stick snowflake, paper angels or even recycled CD ornaments! So this year, we’re going the same route, and adding a new one to the collection – a DIY Unicorn Paper Ornament. Let’s go and make our tree a little more magical! 1. Trace the patterns on the selected colored craft papers from the given template. The template includes 2 outer ear patterns, 2 inner ear patterns, 1 horn pattern, 1 mouth pattern (bottom part of the unicorn’s face), 2 blush patterns, 5 spiral flower patterns and 6 leaf patterns. 2. Attach the inner ear parts (pink) on the outer ear parts (same color you chose for the unicorn head). Glue the ears on either side of the unicorn’s head, sticking them on the back. Glue the mouth pattern on the bottom of the unicorn’s face. 3. Glue the blush patterns on either cheek. Use a black sharpie to draw the eyes, nose and mouth of the unicorn. 4. Take the horn cut out and apply golden craft glitter all over it. 5. Attach the horn on the top of the unicorn head, sticking on the back, so it appears in the middle of both ears. 6. 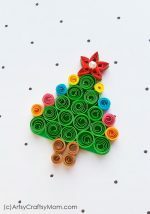 Create flowers with the spiral patterns. Simply roll the spiral from the outer edge all the way to its center and then glue the rolled part with the center to secure it. Attach a small bead in the center. 7. Attach the flowers along the top of the unicorn head, below the ears and horn. 8. Glue the leaves between the flowers. 9. Select a craft paper to cut out a 15 inches long and 2 inches wide strip. Create small and even accordion folds on the strip. 10. Attach both open sides of the accordion folded strip. Hold any one side of the roll (accordion folded roll) and press it towards the center to flatten it. Cut out 2 round patterns and glue them on the center of the flattened accordion folded piece, on both sides. 11. 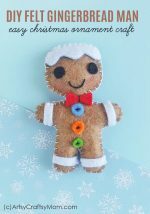 Cut out a small piece of yarn or string and tie its open ends together. Attach it with the accordion folded piece. You can either glue the yarn or make a hole on the accordion folded piece and then thread the yarn through. 12. Finally, attach the unicorn head right on the center of the accordion folded piece and allow the glue to dry completely. How pretty is this little unicorn paper ornament? 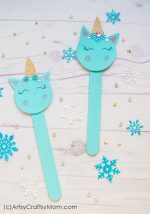 I could craft with unicorns all day long, whether it’s making a unicorn pouch or a unicorn CD craft! 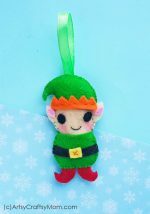 This little ornament is perfect to add some color and magic to your tree, not to mention that little bit of bling!! And when it’s the New Year, you can take it out and hang it in your room to remind yourself of your unicorn-ness!